When it comes to finding a decent heated cat bed for your cats, it can be quite a difficult task. This is mainly because a large number of the providers on the market right now only provide a certain type of heated bed. There are not many that are able to provide a wide range of beds that make it easy to find the one that is perfect for you and your cats. Millard is one of the few companies that provides a wide range of cat beds. But how can you know for sure which one your cat will like the most? Here we will take a look at five of the different heated cat beds offered by Millard. We’ll also aim to answer any questions you might have about the different beds so then you can figure out which one is the best for your cats. Out of all of the heated cat beds provided by Millard, this is the one that looks the most traditional. This bed has velour bedding material, which makes it very soft and comfortable for cats to sleep on. This bedding material can also be removed and placed in the washing machine, making it very easy to keep clean at all times. The bed also has an internal thermostat which regulates the temperature, so then it only starts to heat the bed when you cat has climbed in and made itself comfortable. This not only saves on energy but also helps your cat to fall asleep peacefully. The only real downside with this cat bed is that it doesn’t have a great deal of padding. The velour bedding material does make the bed nice and soft and comfortable, but this material is quite thin compared to other beds. This is naturally a design choice, so then the heat that comes through the base of the bed is able to reach the bedding and make the cat more comfortable quickly. While the bedding may be noticeably thin, it is unlikely that this will disrupt your cat’s sleeping patterns much. The sides of these beds are quite flexible, so they will probably bend if a larger cat is attempting to climb over them. They do however spring right back into place afterwards, so there is no risk of the cat doing any damage either to itself or to the bed. The flexible sides also mean that if you have a couple of cats that prefer to share a bed, they will be able to snuggle up together without any risk of causing the bed to be misshaped. This is a question that often gets asked about heated cat beds and generally the answer tends to be the same, regardless of the model in question. If you are able to plug the bed into an indoor electrical socket, then you can have the cat bed outside. The only thing you have to do is make sure that it is left undercover at all times. It is an electrical appliance so if it were to get caught in a rain shower it can be a serious health risk, so make sure it is always covered. This product from Millard really is wonderful thing to have in any home that has pet cats. 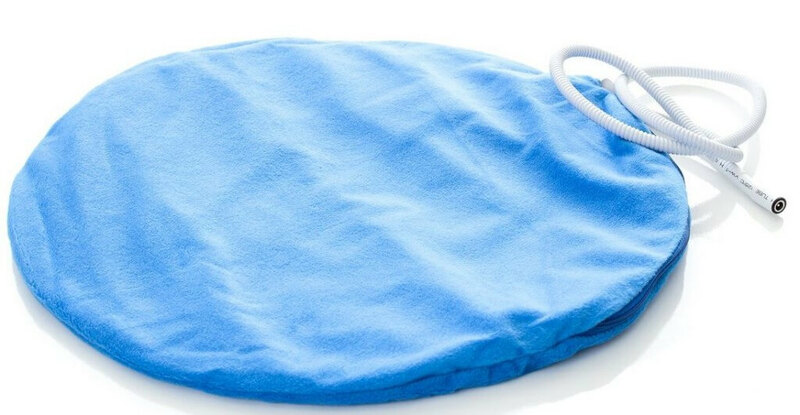 This bed warmer is a very simple heating pad that can be placed in any cat bed while it warms the area, so then your cat will be able to get comfortable on a heated bed and have a good rest. It has a built-in timer so then it can heat up the bed whenever the cat climbs in and then bring the temperature back to normal again when the cat climbs out. This can be a wonderful addition to the home, particularly if you have a cat that likes its bed and wouldn’t feel comfortable with something different. This bed warmer means they will be able to get warm in their own bed without having to make any changes. Some customers have complained that the bed can get a little too hot for their cats to be able to handle it, but this probably due to the design of the bed in which the warmer is used. In most cases, cats will be able to lie on top of the warmer and get comfortable in no time at all. Yes, this bed warmer can be used in almost any cat bed. The only thing you will need to take into consideration is the cord with which you plug the bed warmer into the electrical socket. If you are okay having the cable come through the entrance to your hooded bed that this fine, but there is a chance that your cat may not like this. If that is the case, you will probably have to cut a hole in the back of your hooded bed in order to feed the cable through. This is entirely up to you. The warmer itself only comes on when it feels the pressure of your cat climbing on top of it. When your cat gets off the heater turns off straight away. This means that it is relatively safe to be left on at all times. Some customers have said that they have left this bed warmer plugged in for months on end without having any issues. It ultimately comes down to what you are most comfortable with, as some people would not feel safe leaving it on while they’re out of the house. It is however safe to be left plugged in over a long period. This heated cat bed provided by Millard is unique in the cat be market, as it is one of the few that comes with a hood over the bed. This bed is very similar to the other bed from Millard that we have looked at, in that it is made with the same soft bedding material and it comes with an internal thermostat. The hood is a wonderful little addition which makes the bed look all the more comfortable. The hood can be removed at any time and it is machine washable, so it can be kept nice and clean at all times just like the other bed. In some cases, the hood means that it can get quite warm inside the bed. Depending on your cat, they may find that they are only able to handle being inside for so long. There is however a way of making sure that your cat is able to stay comfortable at all times when inside the bed. Simply remove the hood after the cat has been inside so then the cooling process is given a little helping hand. This way the bed will not be as warm when your cat climbs back inside later and they will be able to get comfortable. This bed will be able to keep two kittens warm no matter where in the house you decide to put it. The interior of the heated bed is reasonably large, so two kittens should be able to fit inside without a tight squeeze. In fact two reasonably average sized adult cats should be able to fit inside without a problem as well. The internal thermostat will be triggered when the cats climb inside, so it will instantly start getting warm so they can get comfortable quickly. 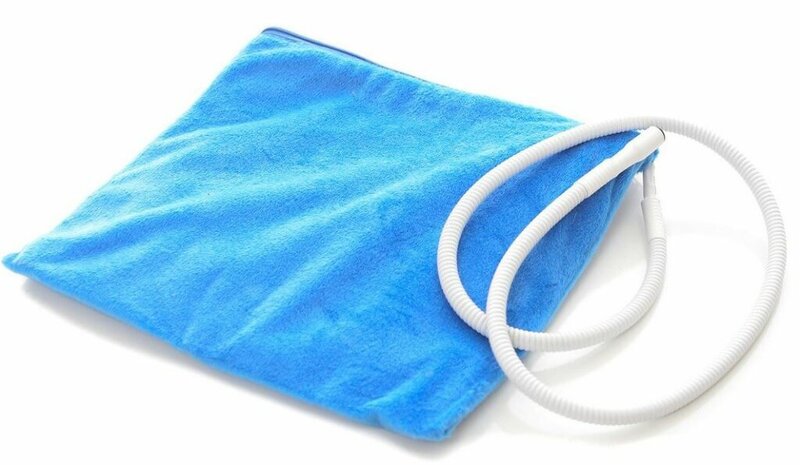 The heating pad will work without a hitch when the hood has been removed. The internal thermostat will still be triggered by the presence of a cat with or without the hood. This means that your cats can still get comfy and enjoy the warm bed even when the hood is in the washing machine. 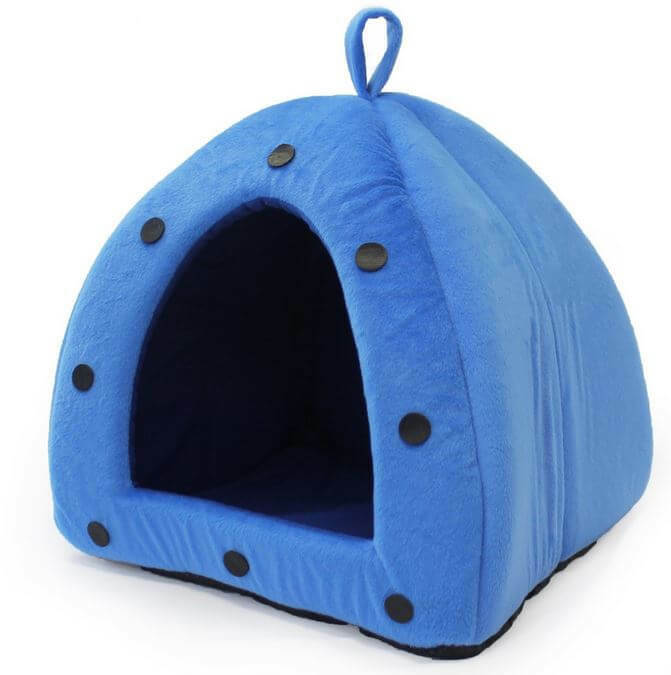 If you are concerned however that your cat will not like the hood and they would much rather have a heated bed without a roof, then you should probably consider purchasing the other Millard cat bed we looked at first. If you are looking for a heated cat bed that doesn’t have to be plugged in so it can regulate head, then this cat mat from Millard is certainly something you should consider purchasing. 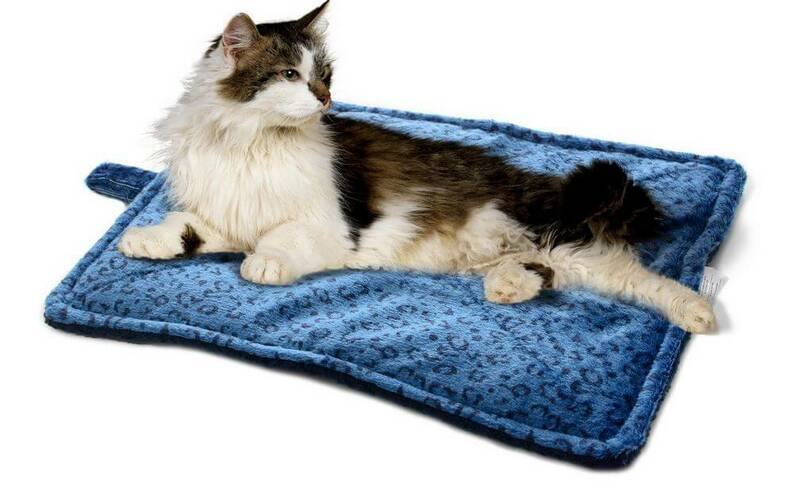 This mat is designed to absorb the body temperature of your cat, so then the mat matches their temperature so they feel nice and warm and comfortable straight away. To make it even more appealing, the whole of the mat is machine washable. This means you can just throw the whole thing in the washing machine without having to worry about taking the cover off. A few customers have complained that the mat can make a crinkling sound when the cat climbs on, like someone is scrunching up paper. This is no doubt the sound of the material inside moving around. In most cases the sound of the crinkling is inaudible, but if it is starting to bother you then it can be moved to somewhere where you will not hear it as much. That is one of the beauties of it not being electrical – you can move it to anywhere in the house. This mat is designed to match the body temperature of your cat, so the environment in which it is placed really doesn’t matter. 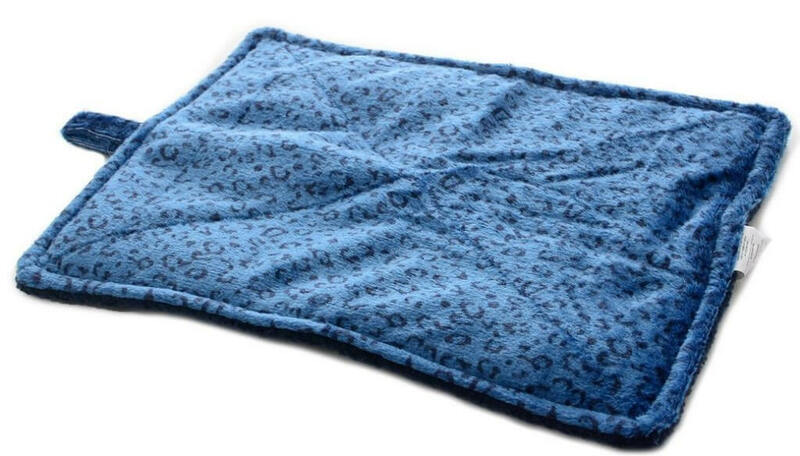 This means you can easily place it outside even in the middle of really cold weather and your cat will be able to climb on and still feel the warmth coming through the mat. It also means that it can be placed anywhere in the house, including the cellar for example, which is a place that can typically get rather cold. Millard offer this mat in three different sizes. The sizes are small (21”x17”), medium (23”x30”) and large (27”x35”). 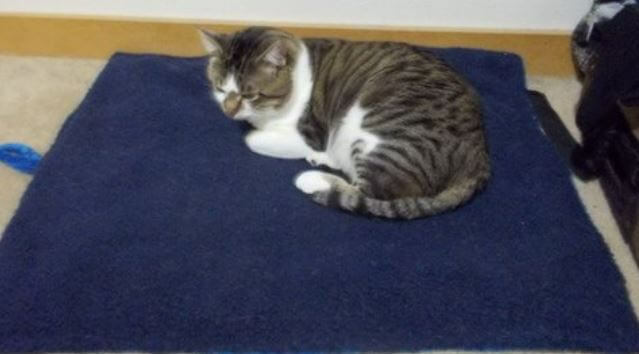 The largest mat would be able to handle several smaller cats like kittens or young adult cats, but it probably would be a tight squeeze for two large fully grown adult cats. If you have any doubts that they will be able to fit on the same one, then it is probably best you buy two so then they are able to get as comfortable as possible. This cat bed warmer from Millard is very similar to the one that we looked at previously, only this one is a little more suitable if you have a cat mat instead of a bed. 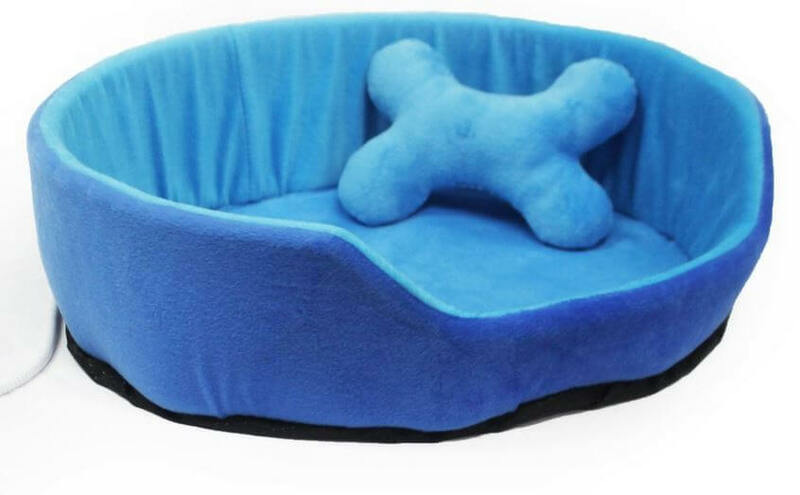 While the other warmer for more suited to be placed in a bed, this one can sit comfortably on top of a cat mat and heat it up whenever your cat decides it wants to get comfy and take a nap. This warmer is able to regulate its temperature based on the temperature of your cat, so then it can get comfortable without getting too warm. The warmer can also be cleaned with a damp cloth, so there is no need to even put it in the washing machine. Some customers who have purchased this bed warmer have said that they don’t think the warmer gets warm at all and that they have tried different things but the temperature doesn’t go up at all. It is important to remember that the warmer is designed to match the body temperature of your cat, so it may not feel very warm to human touch. It also can take a moment in order to start getting warm, so those are things to take into consideration when you buy this cat bed warmer. In total the cord is nine feet long, making it ideal to place almost anywhere in the home. From where the bed warmer starts, three feet of the cord is chew protected, which means that your cats will remain safe even if they decide they want to start chewing on the cord. This can bring a great deal of peace of mind, particularly if you have a few kittens that like to mess around and chew on things. If the cover you want to put on the mat is thin, then that is fine. The warmer should still be able to notice the temperature of your cat and thus heat accordingly. If however the cover you want to put over it is quite thick, then it possibly should be placed underneath the bed warmer rather than on top. If the cover is thick, the bed warmer might not be able to register the body temperature of your cat and won’t be able to heat itself as a result. There are not many heated bed providers out there that are able to provide a wide range like Millard. 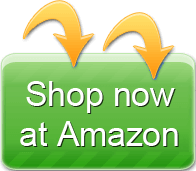 Even if you want a heated bed, or you just want something that will heat the bed or mat that your cat loves to sleep on, Millard have the range of products that should help you purchase exactly what you need without any hassle. I bought a milliard cat heater for my outside cat,it came with a cat house.The heater does not work!I called the company they were we will get you a new heater right out.Will also send return label for you to return the other.That was over 3 weeks ago.Have called and left messages because they won’t answer my calls now.Don’t buy these products their defective. My cat and I just love, love, love this product. It performs exactly as advertised. I do unplug it whenever I’m not at home for safety reasons. “Tippur” is almost 18 years old and has arthritis in her hips, so it’s a big comfort for her ! !